In the July 8th issue of Maclean’s Barbara Amiel writes about the abortion she had in 1965. She was 24 years old and four months pregnant. She shares this story in the context of a piece on maternal instinct in our society, or the lack thereof. Does she regret her abortion? Did she understand what the abortionist did to her or her child? Perhaps it is rank sentimentality, that cheapest of thrills, that brings tears to my eyes when I watch the graceful mating ritual of weedy sea dragons mirroring each other’s movements as they dance into the underwater night to mate and transfer eggs onto the male for safekeeping. Perhaps it is the shadow of errors my free will made. Meanwhile, having your daughter view the BBC’s Planet Earth or Life series would be a cool move. Even better, it’s in most public libraries—taxpayer dollars paying for material extolling the propagation of life—even while we pay Dr. Morgentaler’s followers for its extinction. Amiel calls her abortion a murder. I was surprised to see this language in Maclean‘s. She almost seems regretful that she had her abortion. Perhaps she is. It’s a sad story. I too, have recently taken to noting the lack of maternal instinct around me and the manner in which many mothers, even, devalue their own position and work. Crazy upside down world. We claim to value family and relationships above all else, but we do not act in a manner conducive to supporting this apparent belief. Yes, I’d be interested in hearing the whole story. Perhaps she’ll share it someday. She wrote about it in her autobiography back in the late 1970s or early 1980s. I remember that she wrote that she didn’t feel “sentimental” about the aborted child, but that her reasons for the abortion were “reprehensible”. 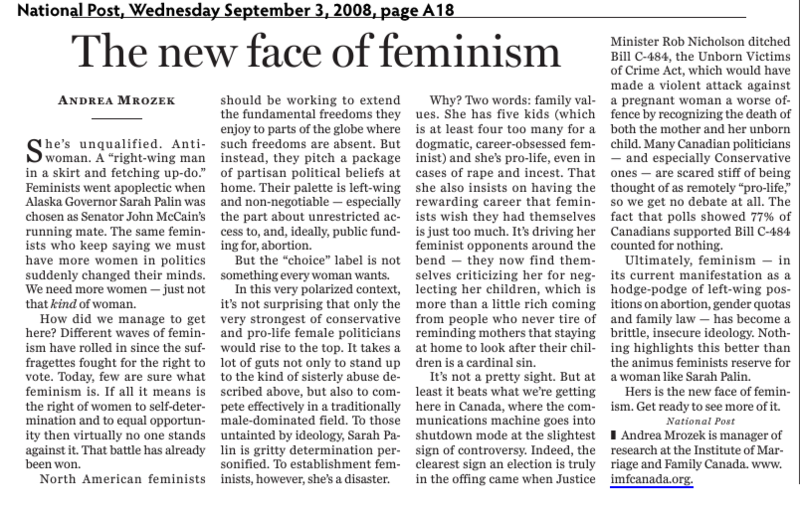 She also wrote that abortion was one of many issues where she differed with left-wing feminists. According to Wikipedia (worth reading, by the way), Barbara Amiel has had 5 husbands, and no children. That is the lie of it all: that there will be other men, and there will be other children. For so many women, it does not work out that way, and their only child ends up being the one they aborted. That in itself is huge grounds for remorse and regret.